Comet 67P Churyumov–Gerasimenko, or just plain 67P has been a bit of a superstar ever since the European Space Agency’s Rosetta Probe fell into orbit around it in August, 2014. On September 30, the probe will end two years of solid science with a programmed death dive into the head of the comet. This isn’t quite as dramatic as it sounds; 67P’s gravity is several hundred thousand times less than that of Earth. Rosetta will gently tumble at breakneck speeds of 90cm a second. In fact, on hitting 67P’s gnarly terrain Rosetta may bounce off, careening back into space for future space travellers to find and ponder over. 67P has seen it’s share of drama. On contact with the comet. Rosetta will join the Philae Lander, which unfortunately was given up for dead two days after landing. This was due to an awkward landing on the comet’s uneven surface which saw the lander wedged in a sunless crevasse. 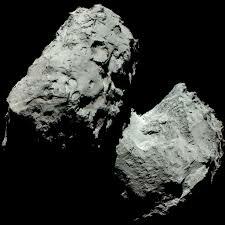 But Rosetta has actually been quite sucessful; both in terms of technical achievement and in new discoveries. In situ discovery of complex organic molecules further cements the possibility that comets may seed the universe with the precursors of life. 67P is believed to have originated in the Kuiper Belt, an ancient cloud of dust and matter hailing from the primordial Solar System. The significance of organic compounds on 67P (or any similar body for that matter is this: their presence may indicate that life precursors may have existed in the primordial cloud from which the Solar System formed. This is exciting for astrobiologists no doubt, and we look forward to more sciencey goodness. In the context of near earth like planets being discovered all the time studying these findings may be important to humanity’s future among the stars. It’s been a fun ride, Rosetta, and every image, every discovery has shone a little more light on our universe.